We provide a broad range of dental services with an emphasis on patient comfort, education and prevention. Our goal is to help you keep your smile healthy for a lifetime. We live and work in the community. Since this is a family business, you are seen by someone who knows you well and has a familiar face. Should you need dental services, we will always let you know the time needed and the cost of services in writing before any work is started. We encourage any questions and are happy to provide a consultation appointment prior to any dental treatment. Dr. Joseph R. Ceisel D.D.S. Dr. Ceisel grew up in the Chicago suburbs. He attended the University of Illinois College of Dentistry. Upon graduation, Dr. Ceisel chose to help the underserved population in Northern Arizona. He joined the Indian Health Service, and dedicated the next 3 years to providing dental services to the Native Americans on the Navaho Reservation in Many Farms, Arizona. Dr. Ceisel was proud to contribute to better dental health for the residents of the reservation – some of whom lived in hogans without electricity or running water. 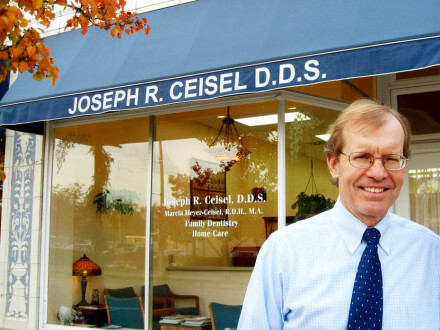 Dr. Ceisel has been a member of the Wilmette Rotary Club for 20 years. In 2001, the Wilmette Rotary and Barrington Rotary Clubs jointly funded a project to outfit a small bus as a portable dental office to send to Mexico to provide no-cost care to needy patients. Dr. Ceisel volunteered to outfit the bus with cabinetry, a portable generator, X-ray machine, and a dental unit. Dr. Ceisel was gratified to learn that as of October, 2012, the bus was still in use and patients were still receiving dental care. Later, Dr. Ceisel volunteered for 2 trips to South America. One trip was to Guyana, and the other trip was to Venezuela. 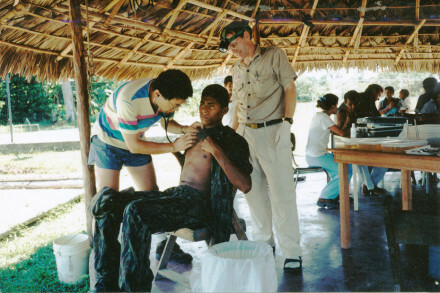 He was part of a group who provided dental care to the native inhabitants in the remote jungles of those countries. 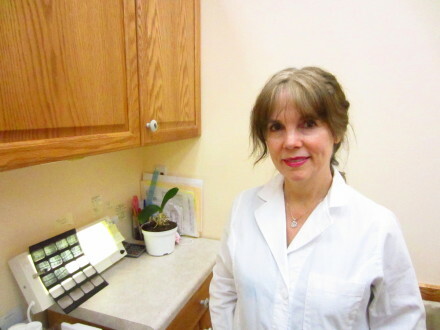 Marcia is a registered Dental Hygienist who graduated with honors in Dental Hygiene. Later, she earned a degree in Vocational Education and Training Development, and became a first-year clinical instructor in a dental hygiene program. In 2010, she earned a Masters degree in Psychology. Marcia has been practicing dental hygiene for over 20 years. She has experience working in a periodontal practice, a child specialty dental practice, as well as family dental practices. She is proficient in administering local anesthesia, and takes great care to be gentle and thorough when treating patients. In keeping with their desire to help those who do have limited access to dental services, Dr. Ceisel and Marcia volunteered (through the organization Remote Area Medical) to go to Tennessee to provide dental care to the poor, under-served population who live in the remote hills of eastern Tennessee. The need was great—people lined up for hours before sunrise to have a chance to receive no-cost dental care. Marcia loves to work with children and seniors. Her objective is to provide the best care in an environment that is positive and non-judgemental. She is also interested in nutrition—especially the scientific research that shows that optimum levels of vitamin D3 have a positive effect on general health and well-being.